When I read that the theme to this year's Sunderland Illuminations was to be Alice in Wonderland I just knew we needed to visit. 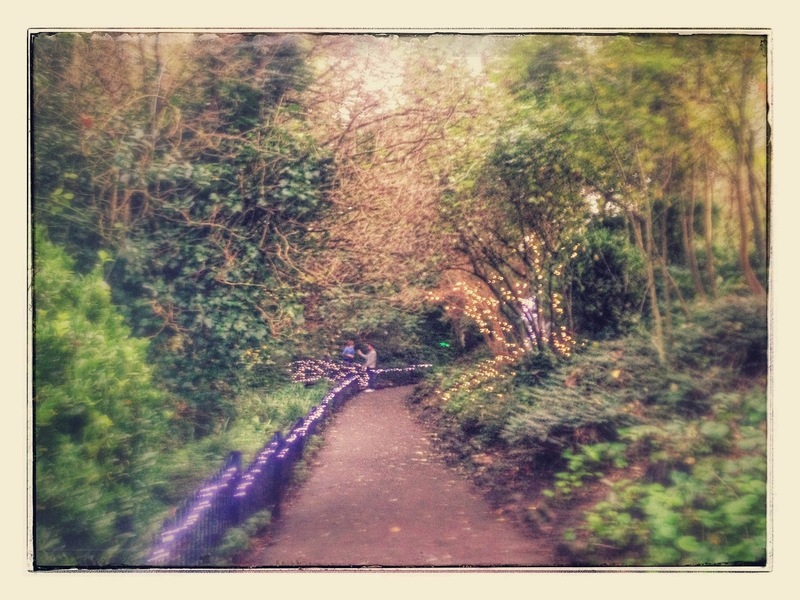 So this Friday we headed over to Roker Park in Sunderland after school to have a look around. There ended up being so much to do that we ended up spending a good few hours exploring the park. We arrived at Roker Park just after 5pm. It was still nice and light so we played in the two play parks for a while. 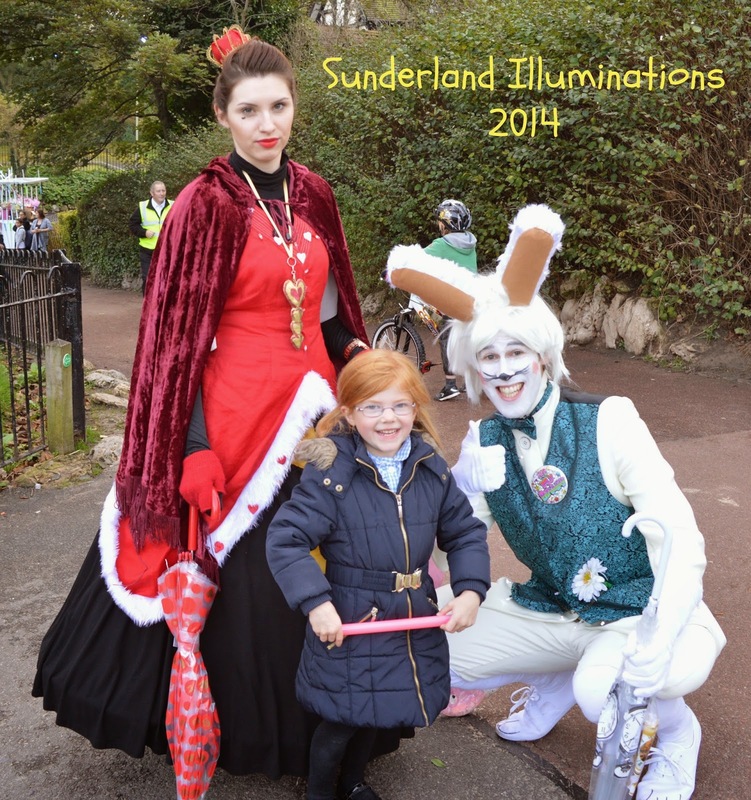 It wasn't long before we spotted the white rabbit and the Queen of Hearts herself and they were happy to chat to us and pose for photo's. Heidi absolutely loved this! As it started to get a little darker we headed over to the bandstand area in the centre of the park where we picked up an activity booklet and special illuminations pen (£1). The activity booklet contains special activities, a white rabbit trail, pages for autographs from your favourite characters and a mini map of the park. Very good value! We decided to start the White rabbit trail and used the mini map in our activity book to hunt for 8 white rabbits placed around the park. This was lots of fun and brought out the competitive side to our family! We all took it in turns to lead the way and we were chuffed when we managed to find them all. We completed our details on the trail form and handed them back into the kiosk staff for our chance to win a family ticket to see Snow White and the Seven Drawfs at the Sunderland empire with an overnight stay at the Sunderland Marriot. Fingers crossed we're lucky! Half way through our trail we decided to stop by the lake. I was very prepared and had packed some snacks and drinks however there are food kiosks available too. The lake is the perfect place to rest tired legs as there are plenty of seats and there is a light, water and music show to enjoy while you admire the view. After our re-fuel we continued to walk around the park and bumped into the Cheshire cat and Alice in Wonderland on our travels. The actor's are really very good and use lots of expression and comedy. They stay in character the whole time and our children loved them. It was starting to get dark and the crowds were starting to increase. The lights were absolutely beautiful in the dark - we particularly loved the Fairy Dell which was a little cove of woodland all lit with magical fairy lights. I didn't manage to get a good picture that does it justice - just make sure you don't miss this part. Our children also loved being brave and crossing the fairy bridge to touch the (cardboard) troll. There is a model railway in the park (£1 per ride) and there were craft activities on offer by the bowling green (they were making fairy wands today) plus a few fairground rides and a local choir were entertaining the crowds by the bandstand. The atmosphere was lovely but after two hours it was sadly past our little one's bedtime so after a final play in the park it was time to go home. We walked back along the promenade to our car, admiring the lights along the road and trying to resist the amazing smell of fish n chips from the beach house as we walked past. We had a fantastic time at Sunderland illuminations and would highly recommend a visit before they end on 2nd November. Every day throughout half term there will be a different craft activity taking place in the bowling club between 5pm and 8.30pm. These activities are FREE and you can pop along anytime. We made a little video of our visit too. We hope you like it. Oh wow, what wonderful illuminations! They have really gone to town on quality displays and the whole event looks like it was done brilliantly. I love the bridge covered in fairy lights. It was wonderful - it's about 20 miles away from where we live but certainly worth the trip. We'll definitely be returning next year. I wonder what the theme will be? These photographs are fab! I did a post on them too :D I like how you've shown them during the day as well :) hope you had a good time! Oh wow, these lights are just beautiful. I love that the actors stayed in character the whole time they were talking to you and that they autographed the activity book you got, it's the little things that make the visit. Thanks for linking up to Country Kids.